A better chance to avoid the Saronic charter milk run . Needless to say we ourselves always opted to cruise the Argo-saronic gulf for two or three weeks each time. The following table gives the characteristics of the Saronic and Hydra Gulf and Argolic Gulf and you might also want to compare the different Greek regions with the Argo-saronic gulf. More dark blue stars the better . The following routes are the result of our own travels and the vast amount of suggestions from my visitors. These itineraries are biased towards tranquil and unspoiled ports rather than touristy hubs like Tiros or Porto Heli. Please toggle between the itineraries with the A through L buttons in the clickable map below or by simply clicking a button in a table. The Winds button, also in the clickable map, will give you the prevailing wind directions and the Meltemi wind direction. 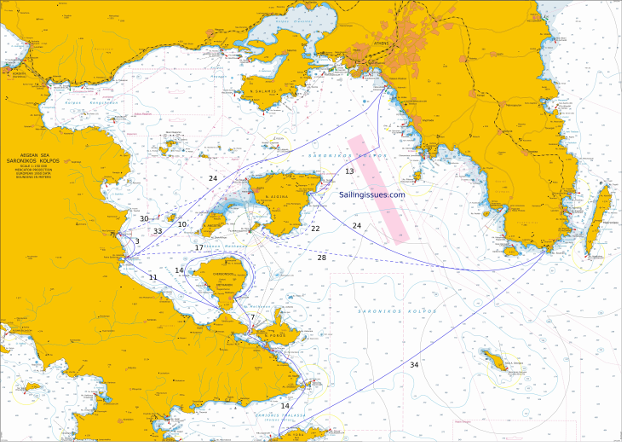 There are no obvious one-way routes possible since Lavrion and Athens are the only two charter bases in the region . And instead of choosing the Athens base , you should consider the mini port of Lavrion. The distances from the international airport are the same yet Lavrion is situated at the south tip of Attica enabling you to visit Sounion, Kea and Kythnos. Moreover, Lavrion is closer to Hydra and last but not least you won't be confronted with the rather ugly outskirts of Athens. Furthermore, Poros is just a tiny base, and few reliable yacht charter agencies have an office there. Most of the reputable yacht charter firms offer their services out of nearby Athens - Alimos/Kalamaki marina. Recent numbers say 95% of the yachts are offered out of Athens (Alimos, Kalamaki) and only a few yachts are available for rent out of Lavrion or Poros. When visiting Aegina you might want to avoid the marina altogether and focus on Perdika on the south or Ay Marina on the east of the island. In the 2 or 3-weeks itineraries it is possible to have one or more rest days/stopovers/onshore excursions. Var­ious inland cities like Mycenae, Argos and Corinth are well worth visiting. 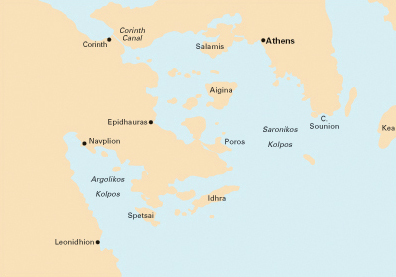 Salamis island and the north coast of the Saronic Gulf are not very interesting. Vathi port on the east side of the Methana peninsula is a peaceful little spot worth the detour: it is surrounded by basalt slopes, which clearly reveals its volcanic origin. The actual port of Methana has a little spa near the entrance. Extend your sailing holidays in Greece to visit the Acropolis and the nearby Tower of the winds, both in Athens. To steer clear of the Saronic charter milk run it helps to charter for more than just 1 week. Also helpful is knowing that this flotilla charter fleet usually sails (a variation on) route A, possibly leaving out Spetses and including Palaia Epidauros. Another trick is not to charter from Saturday to Saturday but for instance from Friday to Friday - you will then be one day ahead of the crowd. 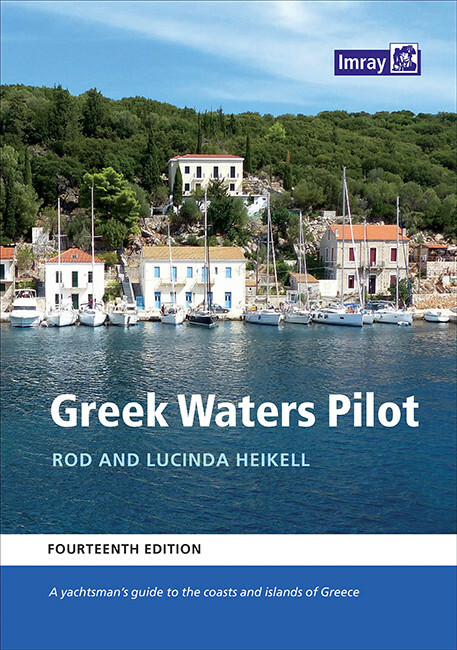 Two of my favourites are Ayios Nikolaos bay on Hydra and of course the anchorage behind Nisos Soupia: see this logbook. Another one is Nea Epidavros, which is located just 3 nm north of Palaia Epidavros and is a delightful place with citrus orchards, a tiny river, cliffs and several good tavernas. Alternatives for Athens to Athens in 7 days: click on the chart below for full-size !